For more than 22 years I have been living with the consequences of a visible tumor in my cheek while I did not even know what I had. And I can tell you, it feels very lonely to be ‘the only one in the world’ with this rare condition and unique appearance. I gave up hope for help years ago, but hoped to get answers to my questions one day. In 2017 I did a second opinion, got diagnosed and was no longer alone. When I was twelve, I started my website about my unknown tumor in my cheek in the hope of ever getting a diagnosis – and to dismiss rude people who asked for the umpteenth time what had happened to my face. Every now and then I received some advice via my website. A few times Hecovan was mentioned, an expertise centre for Hemangiomas and congenital vascular malformations. They specialize in something different than my condition, but I realized that I had a greater chance of success at Hecovan than visiting a random local surgeon without any knowledge in this area. 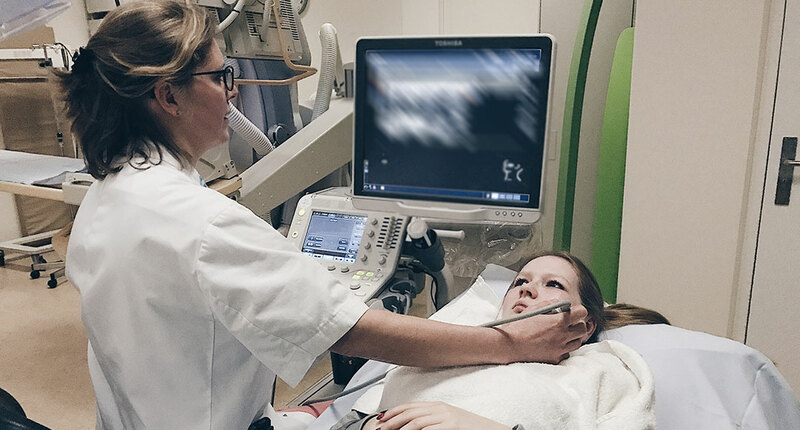 I had to get a MRI anyway – my last check-up was more than three years ago. I also had questions about the heredity of my condition. When I again received an email in which Hecovan was mentioned, I decided that it would not hurt to change hospitals and get a second opinion with the Hecovan working group. The referral via my gp for a hereditary examination, MRI scan and second opinion at Hecovan was arranged without problems. In February 2017, it was my turn. I took my parents with me – after all, they know everything about my childhood and medical file – and also Koen joined my hospital visits for the first time. That turned out to be a great idea, because there was lots of technical explanation about DNA, mutations and sequencing, which is actually Koen’s field of expertise. They made an ultrasound of the tumor in my cheek and afterwards we had an introductory meeting with Dr C van der Vleuten. We talked about everything that happened the past 22 years, including inexplicable things that were not related to the tumor in my cheek according to other doctors. Like my jaw that grows differently. Dr van der Vleuten discussed my file with her team and called me a few weeks later to discuss their findings. We think we found it..
Koen was sitting next to me when I received a phone call from the hospital. Dr van der Vleuten explained that it took a while for them to find a diagnosis, but in the end they came across a condition called Facial Infiltrating Lipomatosis (FIL). Partly due to my unique jaw problems, they found a match with this condition. Turns out we were always right that my jaw problems – and some other things – were related to the tumor in my cheek after all. The team had never heard of FIL before and did not know anyone else with this diagnosis. They first had to read more about this condition. A new phone call was scheduled and a few weeks later Dr van der Vleuten called me with her findings. She was very sorry to inform me that there is nothing that can be done. She apologized and said they would have loved to help me in any way possible. But to be honest, I wasn’t expecting anything else. I didn’t even want to do any interventions. The only thing I was hoping for was a diagnosis – a name that would allow me to search on Google. And they gave me that! Dr van der Vleuten told me about a kind of chemotherapy that is currently being tested in other similar conditions. The chemotherapy does not solve it, but it can inhibit growth. This could be useful for kids whose tumors are actively growing. However, she told me this drug is still in an experimental phase and is only recommended to people who really do not have another choice. It’s good to know that they are working on experiments though and I will definitely keep an eye on the developments of this drug. The following weeks I started searching on Google. There is not much to find: well counted 13 pages. It was not until page 6 that I came across an interesting blog made by a mother of a 10-year-old girl with the same condition. I contacted the mother and we started chatting via Facebook. She added me to a private group on Facebook with 4 other mothers of children with this condition. One of the most bizarre moments in my life. For 22 years I was ‘alone in the world’ and now I suddenly saw 5 pictures of children who were copies of me. Any doubts I had about my new diagnosis disappeared thanks to this group (you become skeptical after 22 years of no/wrong diagnoses). Through the private group we exchange information, keep each other informed of developments and share photos. I see them as my new, extended family. The fact that all children look exactly like me and could have been my brothers / sisters makes it extra special. We have a strong bond and support each other in this tough battle. We are actively searching for more patients with this condition and within half a year we have grown to a group of 20 patients spread all over the world, which is very special for such a rare condition. There will be a FIL community website soon and I have started to integrate FIL in my blog as well. I am learning more and more about myself every day and the idea that there are more people like me feels like a relief. The future will remain a question mark for all of us, but we are no longer alone.